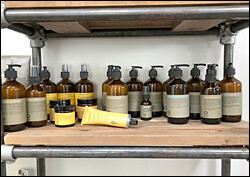 Murray's Fair Hair - Products. In addition, Logona has a shampoo called Lava Earth. Lava Earth consists of volcanic rock and is used as a mud bath for the hair. The good thing is that it contains no soap but washes the hair clean. You use it in the same way as a shampoo: put a blob in your hand, apply it all over the hair, message it in and rinse. Lava Earth is worked into your hair like mud where it removes grease and dirt but deposits minerals onto the hair. As a result, your hair feels soft yet strong and has more volume than after using ordinary shampoo. Lava Earth is extremely gently on hair and scalp and is ideal for fine hair and those with sensitive skin. 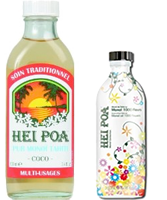 Hei Poa is exotic brand based on Monoi oil which comes from the Polynesian island of Tahiti. Known for its healing, moisturizing and restorative properties, Monoi oil is blended with beautiful blossoms of Tiara to create a sumptuous range of products that will leave your hair feeling great!